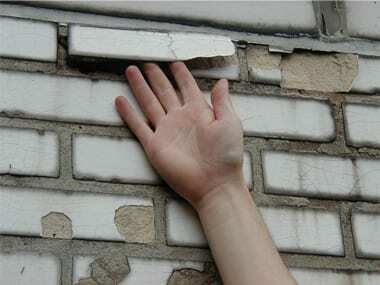 The “Facade Inspection Safety Program” (FISP), also referred to as “Local Law 11” (LL11), is the name for the rules and regulations addressing the conditions of NYC’s buildings’ exterior walls and their appurtenances. FISP is comprised of a section of the NYC Administrative Code adopted by the City Council and fleshed out in a rule promulgated by the New York City Department of Buildings (DOB). Every five years, facades of all NYC buildings over six stories must be examined by a qualified professional, and a report filed with the DOB. Conditions identified as UNSAFE must be corrected on an expedited basis, and conditions identified as Safe with a Repair and Maintenance Program (SWARMP) in one inspection cycle must be corrected prior to the Recommended Repair Date in the FISP report, but not later than the filing deadline of the following inspection cycle. The most recent FISP inspection cycle, Cycle 8, ended February 21, 2019. The next FISP inspection cycle, Cycle 9, will commence less than a year from now, on February 21, 2020, and will run through February 21, 2024. 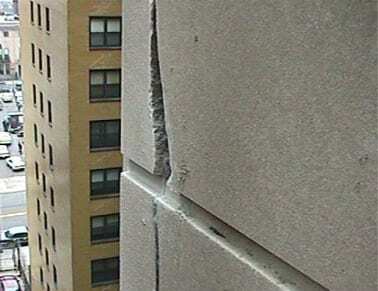 SUPERSTRUCTURES has been performing mandated exterior wall inspections for many of NYC’s most prominent buildings since the inception of the City’s first facade inspection ordinance in 1980. 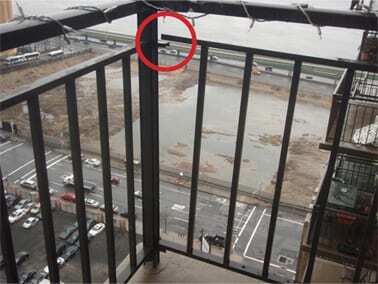 The DOB is in the process of revising Rule 103-04, which governs the details of the Facade Inspection Safety Program (FISP). An update will be provided here as soon as details of the revised rule become available. Please stay tuned. The following significant changes were implemented during the course of Cycle 8, and will continue to be in effect during Cycle 9. The DOB is now issuing ECB violations in instances where previous or current cycle SWARMP items have not been repaired prior to the initial “SWARMP Recommended Repair Date” contained in the FISP (LL11) Critical Examination Report, and a “new” (extended) repair time frame has not been obtained from the DOB. To explain: DOB Rule 103-04 governing FISP compliance filings requires that the QEWI, in their Critical Examination Report, provide detailed recommendations for repairs or maintenance of SWARMP items, including the recommended time frame (indicated in MM/YYYY format), for such repairs or maintenance to be performed “to prevent the conditions from becoming unsafe.” The FISP compliance form (TR6) also requires inclusion of the earliest SWARMP Recommended Repair Date contained in the FISP Report. The Rule also stipulates, that in cases where the SWARMP repairs will not, for any reason, be made within the recommended time frame, it is the Owner’s responsibility to retain a QEWI to request an extension of the recommended time from the DOB. Extended repair time frames may be requested – up to the end of the applicable Sub-cycle of the following inspection cycle (e.g. Sub-cycle 8C to 9C). The request must be accompanied by supporting documents from the QEWI justifying the request for a new time frame. The department may approve or disapprove such a request. 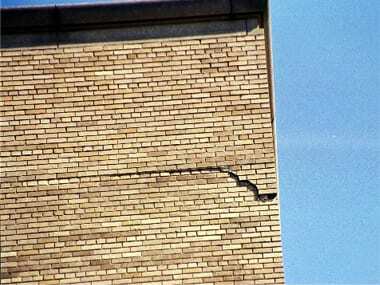 Owners should beware: Violations have been issued to buildings with missed SWARMP Repair Dates, even though SWARMP repairs were underway. Therefore, it is recommended that Repair Date extensions be obtained for buildings on which repairs are in either planned or in progress. The DOB rescinded its policy requiring that documentation of Work Permits be produced for existing balcony and terrace enclosures. This requirement, which stipulated that undocumented balcony and terrace enclosures would have to be removed, had been introduced by the DOB, to the consternation of many, in July 2014. Per the intent of DOB Rule 103-04, “structural soundness” of railings and guards must be classified as “Safe, SWARMP or Unsafe.” Code compliance issues must be reported, and Classified as Compliant, or Non-compliant. Per DOB policy, Non-compliances must be listed as SWARMP in the FISP report – or Unsafe, if necessary. 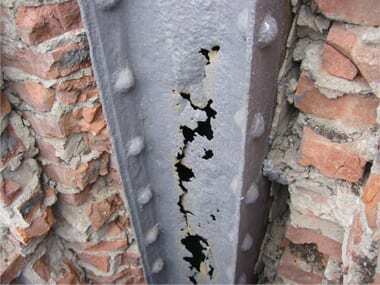 SWARMP conditions must be addressed by the QEWI’s recommended repair date. DOB NOW also provides the DOB an efficient method of tracking FISP-related data, including details of the FISP Reports as well as statistical information on QEWI’s, building Owners and their buildings. For details on the system see here. Note: The follow requirements are in effect through the end of Cycle 8. This section will be revised as required to reflect any substantive changes after the DOB promulgates its revised rule, expected prior to the commencement of Cycle 9 on February 21, 2020. Note: The Department of Finance adds a 2% fee on filing fees paid by credit card. Failure to File an Initial Report: Failure of the owner to file an initial Critical Examination Report prior to the reporting deadline will result in a penalty of $1,000 per year. The DOB no longer accepts “Combined Reports” in cases where a building has failed to file an acceptable FISP report in a prior cycle. In cases where a prior cycle report (e.g. Cycle 8), has not been filed, a report for the “current cycle” (e.g. Cycle 9), is prepared and filed with the DOB. This report addresses SWARMP or Unsafe conditions identified in the latest previously accepted FISP report (e.g. Cycle 7). When the current cycle report has been filed and accepted by the DOB, the DOB may then retroactively levy penalties for both Failure to File ($1,000) per year, plus Late Filing ($250/month). Fill out all requested information. Below the section titled User Account Information you will need to select one of two options. Please select the first listed option – “I do not have a license or DOB Issued ID #– (includes owners, building managers or owner representatives).” Enter your name in “Agreement” and click “Submit” to create your account. For the current cycle, if the 5 year anniversary of a building’s first TCO falls prior to or within the applicable inspection “sub-cycle” (based on the last digit of the building’s Block number), a report is due in Cycle 9. If the 5 year anniversary falls after the applicable Cycle 9 “sub-cycle,” the initial report shall be due during the applicable sub-cycle of Cycle 10 (2025 -2030). 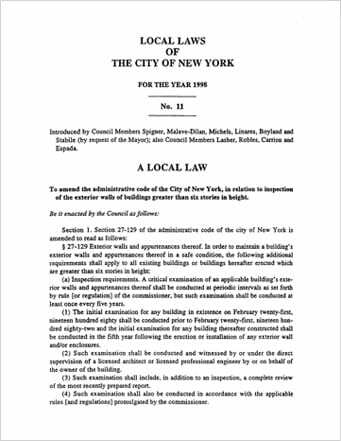 New York City’s initial facade inspection law, Local Law 10, was enacted in February 1980, shortly after a piece of masonry fell from the facade of a building on Manhattan’s Upper West Side, killing a pedestrian. 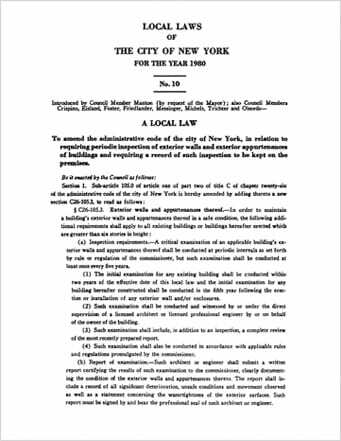 The New York City Council, in an effort to minimize the chances of such accidents ever occurring again, amended the NYC Building Code, mandating that owners of applicable buildings have their exterior walls and appurtenances periodically inspected by a licensed professional engineer or registered architect. 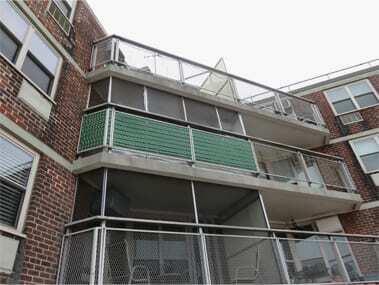 The first facade inspection cycle ran from February 21, 1980, to February 21, 1982. FISP inspections now occur in three “staggered” two-year “sub-cycles,” commencing one year apart. Buildings are divided into three groups, (Sub-cycles A, B and C), based on the last digit of their respective “Block” number (as in “Block and Lot”). See Cycle 9 Information tab for details. The stated purpose of NYC’s facade ordinances is improved pedestrian safety. Every facade type (old and new) exhibits characteristic forms of deterioration. Water is the enemy of building facades, particularly in our NYC climate with its winter freeze/thaw cycles, salt air from the marine environment, and air polluted with chemical salts. 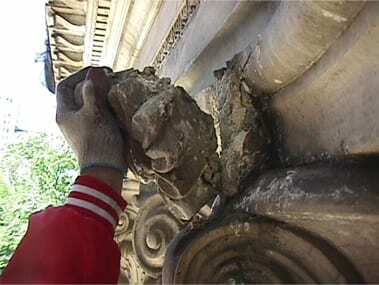 Water infiltrates facades through small cracks in masonry and through deteriorated sealant via capillary action. Pre-World War 2 buildings, many approaching 100 years or more in age, have an intrinsic advantage over more modern structures. They were built with a fortress mentality. Solid masonry walls 24 inches thick were not uncommon. The masonry mass of the wall was used to resist water penetration. 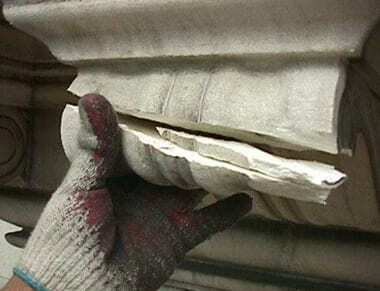 Architectural details such as cornices and belt courses were not only ornamental; they served the functional purpose of helping the facade shed water. However, advanced age, and lack of proper and systematic maintenance of many older buildings have exploited the inherent weaknesses in the systems. In the current speculative building boom, facades often comprise a mosaic of varied materials: expansive glass curtain walls, precast brick and metal panels, and stucco. Assembly of these facades requires rigid construction tolerances in both materials and workmanship, which sadly are not being met. Many of these buildings are already displaying symptoms of facade failures such as water and air penetration – shortly after they are completed. 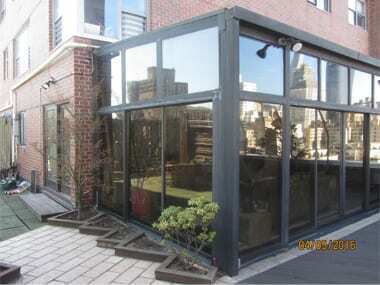 The requirements of the facade NYC’s inspection laws, when followed, serve to provide a reasonable degree of protection of pedestrians from catastrophic facade failures.